Every Christmas I asked for the same thing—a little puppy. 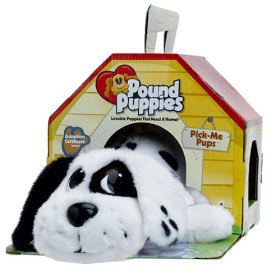 In my dreams, it was a cocker spaniel nuzzling the lid of its gift-wrapped box, like in Lady and the Tramp. My Uncle Walt had a cocker named Goldie, and she was the first dog who inspired in me the hope of meeting my emotional needs through a beast. Goldie would stand on his chest, pressing her forehead against his as they “talked” to each other in whines and whimpers. I thought it would be nice to have that kind of relationship. Every Christmas there were solid reasons for the “No” in my parents' sad eyes: We rent. Puppies are expensive. Puppies eat cats. But then one year … I remember it so vividly... it was the Christmas I lost my two front teeth and consequently burned my tongue on scalding hot chocolate … it was that same Christmas that ... yes, yes, YES ...I didn't get a puppy again. However, the following Christmas, the Christmas that I locked myself on the back porch to avoid the Christmas company, I got no puppy. Yet the very next Christmas, you know, the year that I got a bunch of stuff I didn't ask for and didn't like and didn't know how to fake gratitude for and so drowned in every-widening circles of guilt and disappointment, it was that special year that a puppy was had not by me. As the puppyless years plodded on, my heart calloused. Now I can honestly say that I'm all set with cats. Dogs stink. They lick. They lick you with their stink. Dogs shed. They bark. They bark at their shedding. They ruin vacation plans. They get expensive diseases that produce all manner of discharges. They make you pick up their hot poop with a blue baggy over your hand then carry it around for the remainder of the walk as it sways in the cool night breeze. I'm over it. But Noah's not. He's just getting into it. He can't talk yet, but has developed sophisticated systems of sound and gesture to indicate he wants a puppy right bad. To really drive the point home he'll combine them in rapid succession: lick, “woof!”, scratch scratch, bite paw, point-at-doggy-book, bite cat, etc. And I wonder as I wander out under the sky, with no bag of swaying poo, if I'm doing an injustice or a secret service to a little boy's heart when I tell him kindly that we rent, dogs are expensive, and they eat cats.